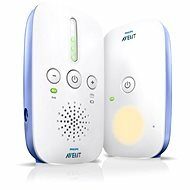 Digital baby monitors Philips Avent SDC560/00 with both sides of sound quality without crosstalk, which will help you monitor your baby day and night. 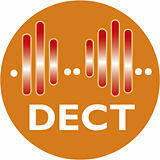 Thanks unique DECT technology you will always secured high quality, crystal-clear sound . Hear every zasmátí weeping and your child. 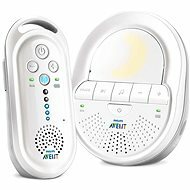 This electronic nanny is ideal for perfect overview about your child and his safe sleep . To transmit a signal, you can choose 120 automatically tuned channels . 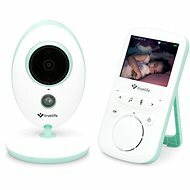 Baby monitor can be powered directly from the mains or battery. Present is also Low battery indicator . 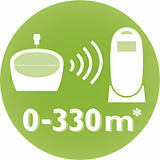 The signal reaches monitors up to 330 meters outdoors and in 50 meters in the building. It gives you maximum freedom of movement. If you still get out of her reach, there is practical warning sign . With a unique DECT technology you'll always ensured high quality, crystal-clear sound . Hear every zasmátí weeping and your child. If you are lucky and the first word. Digital control system "out of reach"
With Display, Temperature sensor, Duplex transmission, Signaling out of reach, Low battery indicator, DECT technology, Eco Mode, Night vision Done! For shipping to other EU countries visit this page Philips AVENT SCD560/00. Für Versand nach Deutschland, besuchen Sie bitte Philips AVENT SCD560/00. Chcete doručit zboží do Česka? Prohlédněte si Philips AVENT SCD560/00. Chcete doručiť tovar na Slovensko? Prezrite si Philips AVENT SCD560/ 00. Für Versand nach Österreich, besuchen Sie bitte Philips AVENT SCD560/00. Magyarországra történő kiszállításért tekintse meg ezt a termékoldalt: Philips AVENT SCD560/00.